1. Use Safer* Graffiti Remover Gel as a cleaning gel. Apply generously, with a brush. For small areas, apply on a soft cloth. 2. When the gel has soaked into the graffiti and it is fully softened, wipe off with a soft cloth. 3. Rinse well with water. Ensure that no trace of chemicals remain. Allow to dry. NB Safer* Graffiti Remover Gel does not contain toxic or harmful ingredients, but if the paint contained lead, the waste will have to be disposed of accordingly. Test before use on plastics. Wear protective goggles when working overhead or outdoors if breezy conditions. Prolonged contact with Graffiti Remover or Wash will soften paint, polystyrene, some grades of Perspex and Polycarbonate. 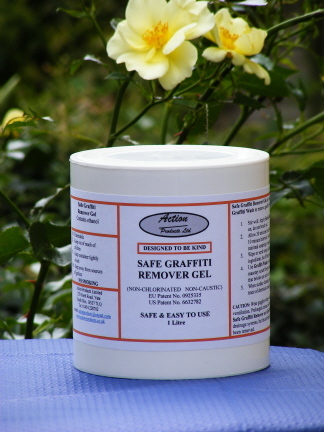 Safer* Graffiti Remover Gel and Graffiti Wash are quite Safer* and may, by themselves, be disposed of via public drainage systems, but the advisability of this depends upon the type and nature of graffiti that has been removed.